Undisputedly, China has become the world's manufacturing powerhouse, accounting for around half of all personal computers, digital cameras and kitchen appliances. However, the country is fast transitioning from low-cost manufacturing to a higher-value, innovation-led economy, a critical transformation that is at the heart of this new title. As Chinese firms begin to transform the country into a truly global innovator, the emerging patterns of future innovation are identified and reviewed. New and dynamic practices are arising that are recognisably Chinese, yet at the same time capable of competing on the world stage. Following the successes of firms such as Huawei, Haier and Lenovo, a growing number of technology-focused firms are now turning their attention towards markets outside of China – a development that will not only benefit the country but will provide exciting opportunities for businesses throughout the world. Georges Haour is Professor of Technology & Innovation Management at IMD Business School, Switzerland. He also acts as an adviser to firms and organisations in his area of value-creation through effective management of the innovation process, as well as commercialisation of technology. He has eight patents, 90 publications and three books on innovation and technology commercialization. 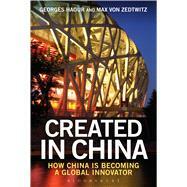 Max von Zedtwitz is an expert in the area of global R&D management and managing business and innovation in China. He is a visiting professor of Strategy and Innovation at universities in China and Europe (Tongji University (China), HSG University of St. Gallen (Switzerland), Grenoble School of Management (France), Chalmers University of Technology (Sweden), Nyenrode Business School (Netherlands)) but is based in Shanghai where he runs a Tongji-based think-tank on "Global R&D and Reverse Innovation".